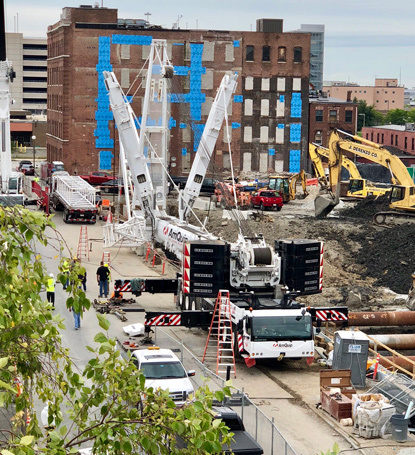 John Hanzl has a bird's eye view of the construction for the 650-unit Harrison Albany Block development in the South End. Today, he watched workers put together the crane that will help build the crane that will help build the buildings. 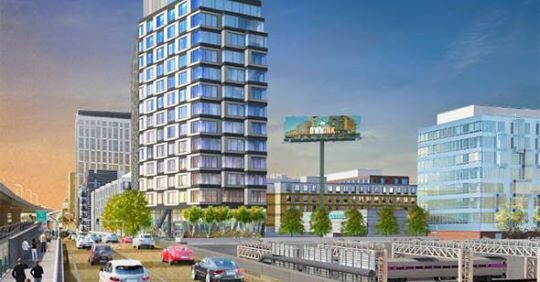 At a meeting of the Boston Civic Design Commission on Tuesday, National Development will show off its latest plans for an Albany Street apartment tower aimed at carless, tech-savvy Millennials willing to accept 500-square-foot studios in exchange for life in the most happening part of the South End, with a full-time activities director and with a large communal kitchen in case they don't want to use their apartment kitchens so they can hang out with their neighbors while waiting for their clothes to dry in the building laundry room, after a hard day of knocking off a proposal or two in the building's co-working space. Read more. Bridge chunks on tracks. Photo by KMV. Granite blocks covering a retaining wall under the bridge that carries Albany Street over the Amtrak and commuter-rail tracks between South Station and Back Bay collapsed on the tracks around 6:30 p.m. WHDH reports no injuries. John Hanzl watched the demolition of a building at East Dedham and Albany streets today to make way for a 650-unit apartment complex. It took three tries. The Abbey Group this week filed details plans for a 5.6-acre development that would combine lab and office space aimed at life-sciences and technology companies on the current site of the Boston Flower Exchange on Albany Street next to I-93. Read more. Boston Police report a man in his 60s was pronounced dead after being hit by an SUV at Albany Street and Paul Sullivan Way around 6 p.m. on Thursday. Police say the crash remains under investigation. The driver stayed at the scene and no charges have been filed. 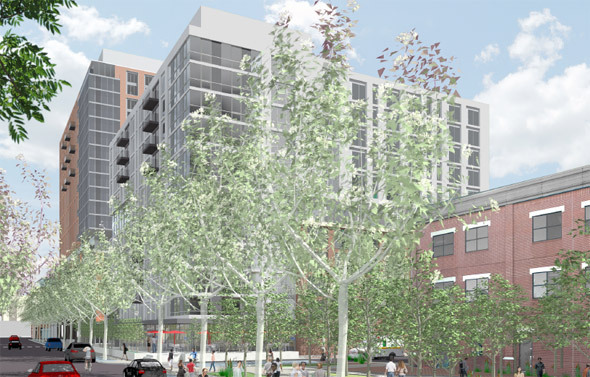 Leggatt McCall yesterday filed formal plans with the BRA for a two-building, 710-unit apartment complex it wants to build between Harrison Avenue and Albany Street and E. Dedham and E. Canton streets. Read more. The Boston Licensing Board today approved the sale of the Broad Street bar's liquor license to a Cambridge restaurateur who plans to sell food cooked in a wood-fired oven in a new building on E. Berkeley Street in the South End. Read more. Stanley Staco reports a motorcycle and taxi collided around 5:10 p.m. on Albany Street between Herald and Traveler streets. The Globe reports the motorcyclist died. MBTA Transit Police report a man responded to a bus driver's refusal to let him off the bus exactly where he wanted this morning by punching the driver in the head, pushing out an emergency-exit window and jumping out. Boston EMTs rendered aid to the driver, stopped at 700 Albany St. around 5:40 a.m. Police continue to hunt for the puncher.